Funk Lounge i Zagreb, Kroatien : Boka nu! 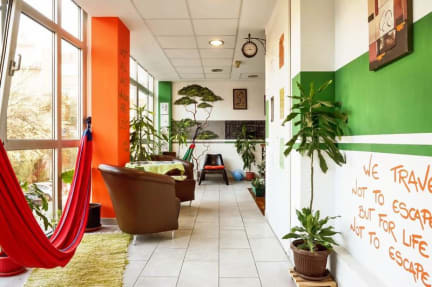 Funk Lounge hostel is a happy, relaxed, friendly and clean hostel in Zagreb with good vibes and chilled atmosphere! With the highest standards of quality, cleanliness, security, comfort and style, Funk Lounge is the perfect accommodation during your visit to Zagreb. We offer private rooms and dormitories. All private rooms and dorms are air-conditioned, have en suite bathrooms and key card hostel entry and room access. Funk Lounge also offers breakfast at additional price of 3 €, you can book it upon arrival. In Funk Lounge hostel we have lounge bar with relaxed atmosphere, friendly staff, good music, delicious drinks and affordable prices. Don't forget to try 'rakija' shot and cheap but excellent Croatian beer at our lounge bar! TUESDAY: Movie night + free pop-corn! *some of the activities are free of charge and for some you need to pay! The staff was amazing and made our stay extremely nice!! Great value for the money. Has pretty much everything you need; clean rooms, good kitchen, free towels, a common area and very helpful staff. A bit of a walk to bus station and center but otherwise great. Recommend!